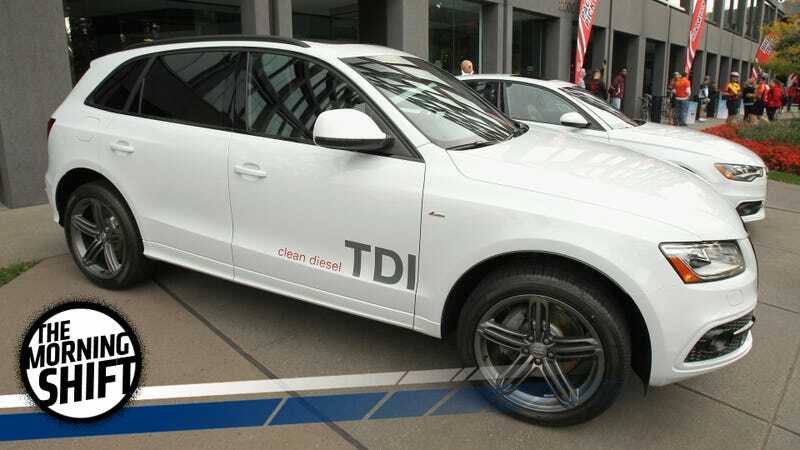 Munich prosecutors said their investigation was in connection with the sale of around 80,000 Audi diesel vehicles in the United States between 2009 and 2015 on suspicion that they were fitted with devices to cheat on emissions tests. European sales were not part of the probe. Audi has been right in the thick of the Dieselgate mess since admitting in November 2015 that their 3.0-liter V6 was also fitted with a emissions defeat device that was illegal in the United States. Additionally, Reuters reports that Volkswagen’s main offices in Wolfsburg were raided for more information as well. About 70 officials including prosecutors as well as state police from Bavaria, Baden-Württemberg and Lower Saxony are involved in the investigation, which is a bit awkward as Lower Saxony owns a big chunk of VW. Those officials have been searching offices and apartments, but not the home of Audi CEO Rupert Stadler, who has been leading the Audi brand since 2007. An Audi official who spoke with Reuters confirmed that officials showed up at Volkswagen Group properties at 8 a.m. local time this morning. Anyways, your day is probably going slightly better so far. So far, that decision to cheat on emissions has cost Audi $1.73 billion in earnings worldwide, according to Bloomberg. Today’s raid coincided with the Audi’s 2016 earnings press conference, where the marque revealed a 37 percent drop in operating profit. Audi’s profit margin dropped to 5.1 percent of revenue, well below its goals of 8 to 10 percent. Audi was the Volkswagen Group’s largest earnings contributor for 2016. Ouch! This explains why they were so adamant about not letting the R18—arguably the most visible symbol of Audi’s big diesel marketing push—run at Le Mans this year. They really, truly need people to quit associating them with the Dieselgate scandal for the survival of their own company. We’re still sad about the R18 staying out of competition, though. The R18 is innocent! FREE THE R18! The agency will restore the original timeline set in agreement with carmakers, which was to determine by April 2018 whether the standards for 2022 through 2025 are still feasible, the White House official said, speaking on the condition of anonymity ahead of Trump’s announcement. The EPA ended its review of the new standards early in order to push them through before Trump’s inauguration. This prompted eighteen auto industry executives to write to Trump in February asking to reopen the review process. Automakers now get to make their case to new EPA administrator Scott Pruitt, who has a rather infamous history of trying to block pollution regulations meant to protect the public in addition to suing the agency he now leads. Oh joy. Trump plans to review the Environmental Protection Agency’s planned tightening of emissions standards through 2025, with a goal of loosening the planned 2022-2025 model year standards for automakers. California was actually pleased with the 2025 emissions and efficiency targets and agreed to harmonize its standards with the Obama administration’s plans, which sought to double average fleet-wide fuel economy to 54.5 mpg by 2025. Any potential rolling back of that plan doesn’t sit well with California, so California Air Resources Board chairman Mary Nichols told Automotive News that they plan to be very active in the newly-opened review of the standards and call BS on some of the claims that they’re not feasible. And as California goes, so goes the nation. So there might not be a choice here for automakers anyway, depending on how things shake out. Trump will court UAW members in their backyard Wednesday, pledging to reopen a review of auto industry fuel economy standards. The president’s claims he’s lifting regulations that hinders jobs risks dividing rank-and-file union workers — who backed the Republican at rates last achieved by Ronald Reagan — against UAW leadership that worked with the Obama administration on the rules and has stood by them. Trump has been pandering to auto union workers since his election, inviting union leaders to the White House, withdrawing from the Trans-Pacific Partnership and pledging to renegotiate NAFTA. On other issues — immigration policies, cabinet appointments and health care reform, to name a few — Trump remains diametrically opposed to UAW leadership, which “will not walk away from our core principles,” [UAW President Dennis] Williams said. Union leaders are also unamused with Trump taking credit for job creation, and claim that jobs brought back into the United States won’t be successful if they’re in union-hostile states. The regular unionized workers, however, are pretty happy with Trump so far (including on issues like immigration, as one Chrysler line worker interviewed by Automotive News “makes no apology for his home answering machine message telling foreigners to hang up,” which is Not Cool and Very Awful), and aren’t happy with their leadership accordingly. On this day in 1968, construction starts on the north tunnel of the Eisenhower/Johnson Memorial Tunnel on Interstate 70 in Colorado, some 60 miles west of Denver. Located at an altitude of more than 11,000 feet, the project was an engineering marvel and became the world’s highest vehicular tunnel when it was completed in 1979. Neutral: Should More States Be Able To Set Their Own Rules? Alright, so this doesn’t entirely square with the interstate commerce clause, but what do you think would happen if all states had their own car rules? What do you think would happen? Do you think automakers would still stick to the mass-market idea, or would you only be able to buy a Citroën in Rhode Island?